For years I've said that I don't like using physical exfoliants on my face (as they can break capillaries), preferring to use a glycolic acid based exfoliator such as Heaven by Deborah Mitchell Skin Polish. However, after trialling Ole Henriksen's Walnut Complexion Scrub last year and falling head over heels in love with it, I figured that I should probably give physical exfoliants more of a chance. 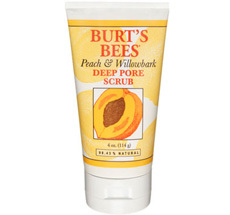 Today's review is of Burt's Bees Peach & Willowbark Deep Pore Scrub which uses finely ground peach stone as the exfoliant. In keeping with the Burt's Bees brand, the tube packaging is both fun and functional. It has a flip top lid and I found it easy to control how much product I dispensed. The scrub has a creamy texture (it doesn't foam) and a delicate peach scent, which was pleasant. However, the peach stone granules felt harsh on my skin. It did the job of exfoliating and my skin didn't feel tight or irritated after use but I simply didn't enjoy using this. I liked that Peach & Willowbark Deep Pore Scrub is a natural product but something about it felt cheap to me, perhaps because it reminded me of drugstore facial scrubs. As a general rule, I like the Burt's Bees brand but I didn't like this. At £10.99 for 110g, I feel that it's overpriced and you'd be better off spending your money on one of the other, much better, products from the brand. I reviewed it last year and I wasn't keen on it either. You are right there is something a bit cheap about it!